While strolling out of Thu Hien Deli with my Banh Mi in hand, I stopped dead in my tracks. No, there wasn't some crazed Banh Mi thief roaming Kingsway (wouldn't it be funny if I had to use the line: "back off, get your own sandwich!"? 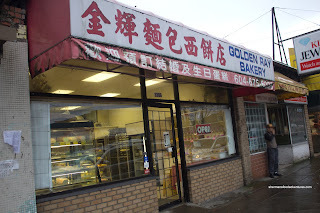 ), rather, I noticed there was a Chinese bakery next door. Interestingly how I never knew it existed, even though I've probably walked past it on many occasions. So I had to run in for some Chinese buns and pastries... For a relatively small shop, there was a decent selection. 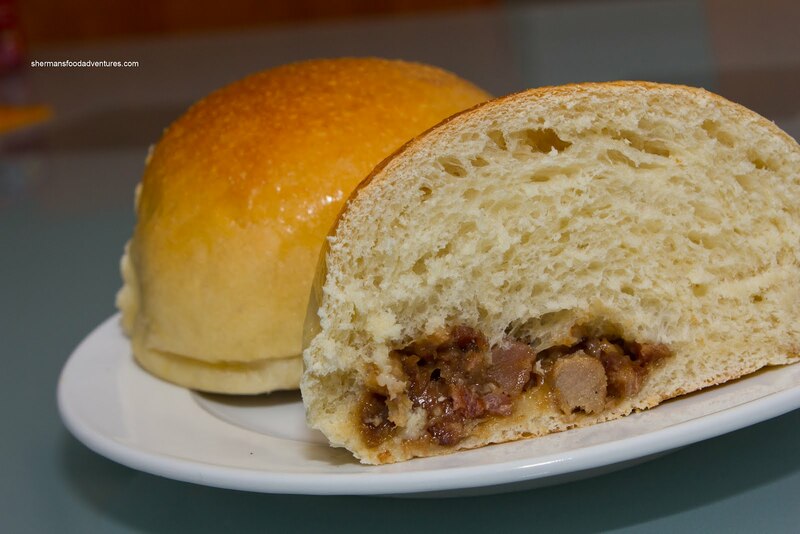 From that, I went with a few items including the BBQ Pork Bun. The darn thing was pretty large and with that, I expected a bevy of BBQ pork in the middle. As you can really clearly see in the picture, one would need to send out a search party or put up posters to find the BBQ pork. It is as if the BBQ pork was attempting to hide from some BBQ monster (a la cookie monster from Sesame Street). To compound the problem, the large amount of bun was pretty dense and even after a quick nuke, it was still not that soft. At the very least, the pork was not that fatty and had a nice rich sweetness. The Pineapple Bun was equally big and the fact it was mostly bun did not matter because we weren't expecting BBQ pork this time. However, it was equally dense and well, you know how I felt about that already. On the other hand, the "pineapple" topping was crusty (which was good, rather than mushy) and was not incredibly sweet. I put pineapple in quotations because the bun has no pineapple in it. Instead, the fact it resembles a pineapple on the outside leads to its name (yes, go figure...). I also got some Egg Tarts for the kiddies and they were not bad. 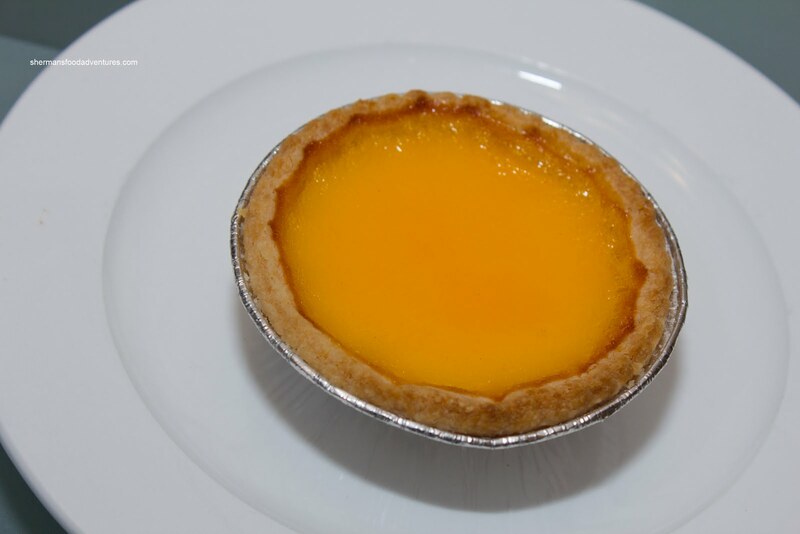 There were baked long enough to achieve some colour in both the custard and the tart shell. At the same time, the amount of baking time made the edges of the custard slightly rubbery though. It is a fine balance between being undercooked and overcooked, yet at the same time I'd rather take this one over undercooked. Lastly, I got something which appeared to be something it was not. 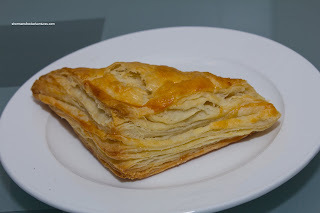 What I mean is that the puff pastry triangle shown in the picture did not consist of curry beef filling. Rather it was a Puff Pastry with Chicken. 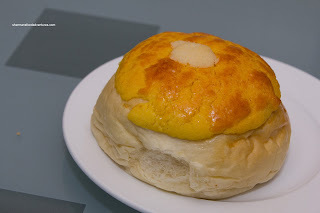 Think of it as a cross between a curry beef puff pastry and a chicken pie. This was pretty good with a properly baked puffed pastry filled with the filling you'd expected in a chicken pie. I personally like the curry beef version more, but this did the job for my daughter as she doesn't eat curry beef (yet). In the end, we concluded that the non-bun items from Golden Ray were pretty good. As for the buns, the dough was a touch too dense for our liking. Furthermore, the filling in the BBQ pork bun was insufficient for the size of the bun. Definitely food value here at Golden Ray, but not necessarily great either.